View cart “Ashevak Adla Diving Bear” has been added to your cart. Ashevak Adla was born on February 22nd, 1977. Adla comes from a family of carvers. His maternal grandfather, Aoudla (Audla) Pee is well known for revealing the spiritual qualities of bears through his carvings of stone. His grandmother, Nurluapik Pee was a sculptor and craftswoman. His paternal grandfather Kalai Adla and his wife Tai carved stone and did drawings. A young Ashevak would watch his grandfather Aoudla Pee carve Arctic creatures out of stone. When Adla was eleven or twelve years old, he started working with carving tools. 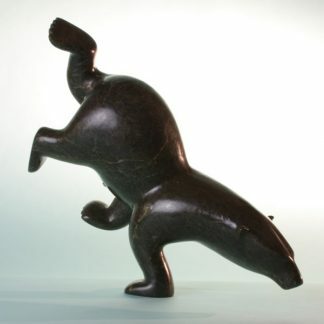 His first carvings were simple sculptures and his first piece was a beluga. He started carving because he wanted to provide an income for himself. His knowledge of the art form came from observing respected artists and carving his own pieces.